Green, environmentally-conscious construction is the driving force behind many new construction projects today. Are you prepared? 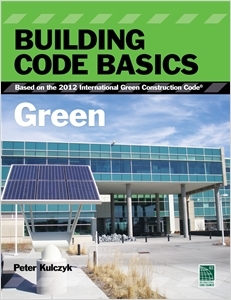 BUILDING CODE BASICS: GREEN will get you there. The book is a practical guide to green and sustainable construction that is centered around the International Green Construction Code® (IgCC®), a comprehensive set of requirements that aims to reduce the negative impact of commercial buildings on the natural environment. Designed to appeal to anyone with an interest in green and sustainable construction, it introduces the mandatory provisions of the IgCC®, while also extending its scope to tackle project electives and jurisdictional requirements, designed to promote the construction of buildings beyond the code's minimum requirements to higher performance thresholds in the areas of material resource efficiency, energy, water conservation, indoor environment, and natural resource conservation. Content includes topics shared by the IgCC® and other green and sustainable standards and rating systems, such as the State of California Green Building Standards Code (CalGreen), the United States Green Building Council's (USGBC) LEED rating system, Canada Green Building Council (CaGBC) LEED Canada NC, and Green Globes, administered by the Green Building Initiative (GBI). Comprehensive yet concise, this is an ideal resource for establishing a strong foundational knowledge of green construction practices. Detailed, full-color illustrations and tables enhance comprehension and help students to visualize complex codes and green concepts. Convenient references to relevant code sections help tie the IgCC® to its real-world applications. Practical, on-the-job scenarios and the use of photographs provide a realistic context for the information and aid students in learning how to apply the code. Highly experienced author ensures content is both accurate and up-to-date with the latest methodologies and standards.